lthough it is not necessary to apply gibberellic acid for camellias to bloom, it can be fun to encourage early blooming and show family and friends the first flower of the season. Since the sasanquas bloom in fall, they do not need to be gibbed; only the spring bloomers should be used for this, since these bloom later in the year. Camellia flower buds can be forced into blooming early following treatment with gibberellic acid in late summer or early fall. In many instances, the treated flowers are larger than normal. A solution of gibberellic acid at a concentration of 20,000 ppm (2%) must be applied to individual flowers to stimulate them into action. To apply, select a well-developed flower bud with an upward- facing leaf bud, and remove the leaf bud with a twisting action. 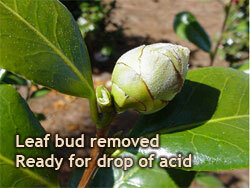 Place one drop of acid in the cup left where leaf bud was removed. The time required for a treated bud to flower cannot be accurately pre-determined. Early flowering varieties may bloom within 30 days of treatment: varieties that normally bloom late often require 60 to 90 days to open. The time to apply gibb differs, but it usually begins the end of August or the first of September. Gibb at weekly or other intervals rather than in one session. This will ensure that you have flowers over a longer period of time. 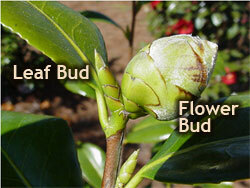 Camellias set flower buds only once a year, so an autumn gibbed bud will not be replaced for spring. Most people like to leave about 80% of buds on a camellia bush untreated. Apply gibb very sparingly to a young plant. "Gibbing Season" runs from September through December to encourage earlier, larger blooms. Many Camellia Show blooms are treated with gibberellic acid. Some camellia varieties respond dramaticallly to gibberellic acid, while others show little or no effect. New, SUPER-CHARGED Gibberellic acid is available and can be purchased at the nursery for $5.00. Enough to treat 100 blooms.